Hello! Just a few weeks back I found this plant in a quaint little store in California and I just HAD to HAVE IT. There was only one problem... I live in Iowa. So, I loaded it up with me on the plane and now this beauty rests near a window in my place that receives the afternoon sun only. The front is still flourishing, but I am worried because the back "leaves" (whatever they actually are; succulent petals perhaps) are starting to yellow and "sulk". I honestly have no idea how to take care of this plant and I was wondering if you could identify it for me and shoot me some advice. I've been watering it only once a week. I have transplanted it from its original pot to this larger pot using "cactus" soil and a thin layer if small gravel on top. 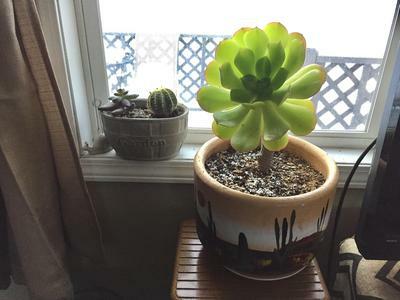 It has been COLD here in Iowa (like -10 degrees Fahrenheit) so I'm worried maybe it's too cold along the window, or not receiving enough sun light, or should I water it more/less... what do you think? How do I care for this silly plant of which I am extremely attached? To be honest, my house is FULL of little succulents of many types everywhere, some are growing like crazy, and some haven't changed at all since I've gotten them months ago... maybe I just need some more education. Aeonium are heat loving plants. They need very bright and warm conditions - as long as it's not outside in -10 degree weather, room temperature is fine, but it needs more - brighter and longer - light. Think about a grow light, on a timer so it gets 12 hours of light and 12 hours of darkness. More about grow lights here. As for watering, once a week is probably too often. If the air in your house is dry (as in, you get static electricity jolts every time you walk across the carpet) you could most likely water about every ten days to two weeks during the winter, more often in summer. 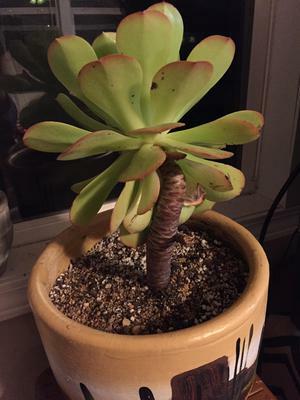 There is more about Aeonium and general succulent care here.